“Welcome aboard, wack”, said Captain Billy, skipper of the tug “Fast Fox”, who clearly hailed from Liverpool. I’ve forgotten his surname, if indeed I ever knew it. Everyone seemed to know him as Billy. This was 1990, and my dealings over the past few days up to arrival in Hodeidah, Yemen, had been pretty exclusively with Yemeni officialdom, so Billy was a real breath of fresh air. His tug, in the ownership of Cory Towage, a UK firm, was on charter to the Hodeidah Port Authority, whose director had instructed him to take me out to the position of the bulk carrier “Nirja” which, laden with bagged rice, had gone aground some days previously when making a nighttime passage into Hodeidah Port via the entrance channel. The ship was stuck there and various attempts to refloat her using the main engine had failed. I was there on behalf of the ship’s insurers and owners to see what could be done. The tug’s mooring lines were let go and Billy conned her clear of the wharf and set off up the channel toward the “Nirja”, which at this stage was just visible some miles distant. The tug was crowded – apart from Billy and his crew, there was the inevitable assortment of harbour officials and sundry hangers-on out for the ride. Some military personnel were there too, since at this time unification of the two constituent states of the Republic of Yemen had just taken place and the general atmosphere was a tad febrile. It had, for instance, been suggested that the grounding of the “Nirja” was a deliberate act by a hostile foreign power, since the ship was now partially blocking the entrance channel and disrupting shipping movements to some extent. It was all a bit political. 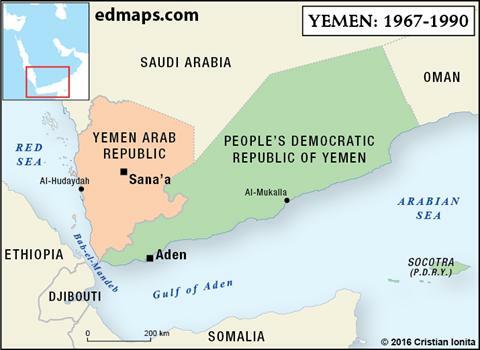 Before unification in 1990, the country was split into two states: the Yemen Arab Republic in the west and the People’s Democratic Republic of Yemen in the south and east. There was ever tension between the two but the general idea was that after 1990 they would work toward integration, a goal not helped by ideological differences and the complex involvement of America in the (nominally) democratic YAR, and Soviet Russia in the marxist PDRY, together with their respective allies. In the 1990’s, Yemen was a rather different place to the extensively war-ravaged country that we see in the media today. Not that it was ever stable: in my own lifetime, between 1948 and 1994 there were no less than eight attempted coups, civil wars and emergencies. Since 1998, al-Queda and Houthi insurgencies led in their different ways to the total warfare which has lasted to this very day, with the involvement of other countries, which visits much misery and suffering, and death, on the civilian population as well as the combatants. Travel between the two unified states in 1990 was feasible, but not particularly simple nor was it 100% safe. 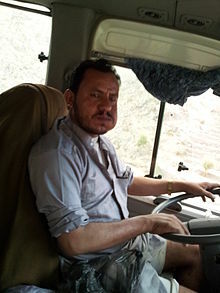 However, I just had to get from Sana’a, the capital, where I had arrived a couple of days previously, to the port of Hodeidah – both cities being in the Yemen Arab Republic. There were two ways to do it – a flight, or by driving. In the event the Hodeidah flight had been cancelled, which at least gave me a chance to see something of the country on the road from Sana’a. Our local agent arranged a car (a Nissan Patrol, which was reassuring) and driver, and we departed the town early in the morning. The distance by road was about 250 kms,by the highway which wound through the Sarawat mountain range, with numerous hairpin bends and precipitous passes. 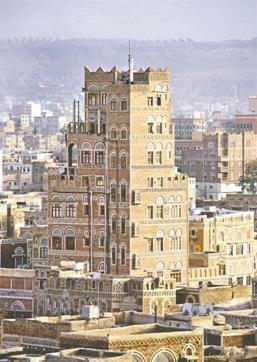 The outskirts of Sana’a featured an amazing phenomenom - ancient skyscrapers built of mud bricks and intricately decorated. Tragically, it seems they have now been reduced largely to rubble. The mountain road was as rugged as predicted, with the odd accident to remind one that sometimes the drivers’ enthusiasm overtook their skill. 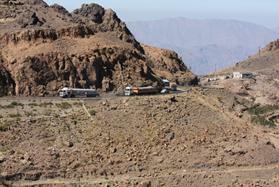 After the descent from the mountains, the final stretch was about 100 kms over the coastal plain into Hodeidah. Everywhere in the mountains where there was a level patch, and significantly in the plain beyond, there was evidence of coffee plantations (Mocha coffee!) which well before 1990 were being rapidly swallowed by a more profitable cash crop – khat [gat, qat] which is ubiquitous throughout Yemen. Most of the men (and no doubt the women, although you don’t usually see that) stuff their cheeks with the leaves, until they resemble a hamster, and chew it to a green sludge. It’s supposed to be a stimulant, and in the south, which is rather less Islamic, they take whisky with it which does seem to enhance the effect. I have tried some, and cannot report much if any stimulation; just a lasting aftertaste of what I imagine privet hedge to be like. Back in Hodeidah, the good tug “Fast Fox” bustled up the entrance channel and closed on the grounded vessel “Nirja”, which was indeed stuck fast with her stern projecting into the channel. Having got on board, I interviewed the Master on the circumstances of the grounding. It seemed that when entering the channel, which was marked with lighted buoys, he had mistaken his position and exited the channel on its east side, where the ship had grounded. It seemed one of more of the buoys had not been lit, which had misled him. He briefed me on the failed refloating efforts to date, and then the next task was to figure out how to get the ship out of its current situation. She had gone aground on a spring tide at high water, following which of course the water depth fell with the ebb tide, and she was well and truly stuck. In the few days since, the tidal range, which is never that big anyway in Red Sea ports, had steadily diminished from its spring tide maximum. In other words, the ship had gone aground on a highest high tide of the monthly cycle between spring and neap tides. Consequently, in her present condition, loaded with cargo, was no chance that high water would refloat her until the next spring tide in about two weeks’ time. 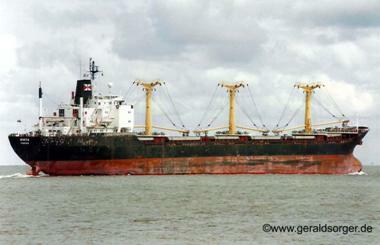 This was too long for the ship to be partially blocking the channel and interfering with navigation in the port. The only feasible option was to lighten the ship by discharging some of her cargo of bagged rice, so that her draft (depth in the water) decreased. This had to be attempted, and speedily. Refloating efforts like this are frequently undertaken by professional salvors who are rewarded by a percentage of the value of the ship and cargo saved, which varies according to the degree of peril that the vessel is in and the extent of effort put in. The big international salvors such as Smit typically operate large ocean-going tugs and can command extensive logistical support and the speedy provision by air freight of equipment such as pumps, air compressors, and so on. If, as was the situation here, the grounded vessel is within a nation’s port limits, then the permission and agreement of the government and port authorities has to be sought before the salvors can enter and attend. 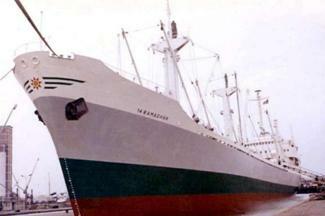 The “Nirja” was not realistically in immediate danger, having grounded on soft mud and in ongoing clement weather, but as was their right the Hodeidah Port Authorities had demanded of the ship’s owners (i.e., their insurance underwriters) that she must be removed due to the hinderance to navigation within the port, and the possibility of damage and pollution if she broke up in future adverse weather. The Port Authorities had decided to do the job themselves, with an eye to the financial reward, and had forbidden entry to the international salvors prowling outside the port limits. My role as the representative of the ship’s insurance underwriters and owners was to liaise and assist, and generally ensure that the reward that the Port had negotiated was justified and fairly earned. The figure was US$ 250,000, which sounds a lot but bearing in mind that professional salvors could in the event of a successful refloating have been awarded around 15% of the combined value of ship and cargo (around US$11M), the insurers would have had to cough up about US$1.5M. So the Port Authorities’ price looked relatively cheap. The first thing was to do some figuring on the weights that needed to be discharged, so I got together with the Master and Chief Officer, to go through the ship’s stability data and do some sums. Soundings around the outside of the ship showed that she was aground on soft mud from the forward end back to about a third of her length; so cargo would have to be discharged from the foremost holds so that the bow rose in the water until the suction of the mud was decreased sufficiently that tugs would be able to pull her free. Soundings inside the ship confirmed that she was dry, so we could assume that that was no damage to the hull plating and therefore that it was safe to pull her off into deeper water. The calculations suggested (it was difficult to be precise) that about 1,500 tonnes, or 60,000 bags, of rice would have to be shifted from the two forward cargo holds, which would require the hiring of another ship, or barge, to be placed alongside to receive the cargo, and a lot of labour to man each vessel. We had to be careful too that shifting this amount of weight locally would not overload the ship’s structure. I returned ashore that night on the faithful “Fast Fox” and through our agents arranged to meet with the Port Authorities’ director Captain Ali Noor. No harm in going straight to the top. We met up the next morning and over the course of several discussions got to be, if not quite friendly, at least on good terms. Ali was a short, pugnacious and ambitious man, who subsequently rose to be a shipping minister in the Sana’a government. I wonder where he is now, if indeed he’s alive, after all the internecine warfare. I explained to Captain Ali that we would need to charter a suitable ship or barge to receive about 1,500 tonnes of cargo. Without much hesitation he told me that he had the perfect candidate, an Iraqi ship called the “Basrah Sun” (previously named “14 Ramadhan” under different ownership) which was in detention in the port, having been arrested by the Authorities for some transgression. The Iraqi owner was in town it seemed, endeavouring to get her released, so could be counted on to cooperate and hence gain some favour with the powers that were. The only significant problem with this seemingly elegant solution to our needs was that she was in Iraqi ownership. At this time, 1990, the United Nations had placed extensive sanctions on Iraq following its invasion in August of Kuwait; and if I was found to be a party to doing business with an Iraqi citizen, i.e., arranging to charter his ship, I would be in deep trouble with my own government. Thoughts of being sent down flashed through my head. “No problem”, said the ever-resourceful Ali. “Come and see me this afternoon”. I did so, and he took me to his office window overlooking the quayside, where the ship was moored and a gang of workmen was busy painting out “Basrah Sun” and substituting “Hodeidah Sun”. “I have confiscated the vessel!” exclaimed Ali, his beady eyes gleaming. “Now she belongs to Yemen, not Iraq!”. I felt sorry for the ill-used owner, but on the other hand it overcame our immediate problem. I was able to sign up to the hire of the ship without contemplating the inside of Pentonville, and later that day the “Hodeidah Sun” departed the quay and made her way to berth alongside the “Nirja”. Efficiently arranged by Ali and his staff, labourers and tally clerks boarded the two ships and discharge of the bagged rice from one to the other started with commendable speed using the “Nirja” cargo derricks. 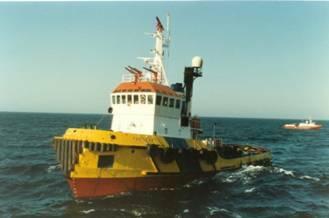 My favourite tug “Fast Fox” was instructed by Ali to make fast its towline to the stern of “Nirja” early on in the exercise, ready to pull the ship off the mud as soon as any movement was felt. Obviously we did not have priority on labour in the port, as other ships needed workers too. Most of our discharge took place on day shifts, and I figured about three or four days to completion. I was therefore pleasantly surprised when, at yet another meeting with Ali ashore in his office early on day three, we were interrupted to be told that the resourceful Captain Billy on “Fast Fox” had elected to give it a try and pulled the “Nirja”, still hitched to the “Hodeidah Sun” alongside, off the mud and into the deep water of the approach channel. The Master of “Nirja” had dropped anchor, Billy had let go and cleared the ship, and “Hodeidah Sun” was in the process of letting go to return to the port with its portion of the cargo. Later that day, once the usual customs procedures had been completed and all the paperwork triple- and quadrupal signed and stamped, I boarded the “Nirja” for the passage into the port up the channel. We took careful soundings round the ship, but she was dry so it seemed no damage had been done. It was however not 100% certain that no damage had occurred to the main engine or propeller during the original efforts to manoeuvre the ship off the mud, so as had previously been arranged, the vessel was towed in by “Fast Fox” and two other port tugs “dead ship”, i.e. without the use of the engine. Captain Ali had amongst his many attributes a keen sense of humour. Now when, as we had done here, you discharge weights from the front end of a ship, it rotates or trims around its centre of gravity; the bow rises and the stern sinks. This decreases the forward draft and increases the stern draft. At Hodeidah, there was a draft limitation due to restricted water depths, so that the maximum draft ships were allowed to enter with was 32 feet. For every inch over that, the miscreant ship would be fined US$3,000. We had discharged sufficient cargo from the forward end so that the after draft on arrival alongside had increased to 32 ft 6 ins. In other words the Port Authorities, for which read Captain Ali, who was probably laughing his socks off, fined the ship US$18,000 for the six inches over maximum permitted draft. This on top of the $250,000 they had made from refloating the vessel. The London insurance underwriters who controlled my destiny, at least in the short term, decreed that I should stay on for the next couple of weeks while the rice cargo was discharged in full from both the renamed “Hodeidah Sun” and “Nirja”, to check whether there was any damage to it. This was a fairly tedious exercise but eventually the task was through and no deficiencies attributable to the grounding were found. Once the financial arrangements (the Port Authorities’ reward for refloating the ship, and so on) had been completed, the “Nirja” was free to leave. It had been decided that she would proceed to the French ex-colony of Djibouti, just across the Bab-el Mandeb strait from Hodeidah, in order to undergo a divers’ survey of her underwater section and check for any physical damage due to the grounding. I was instructed to go along, and very pleasant short voyage it was in fresh sea air after the heat and dust of Hodeidah. The diving survey was completed pretty rapidly, with no damage to the ship’s hull having been found. I said my fond farewells to the Master and ship’s staff, the ship sailed and I was free to return to the UK, the job complete except for the tedious task of writing it all up in a report for the insurers. All in all I’d been in Yemen for about a month.